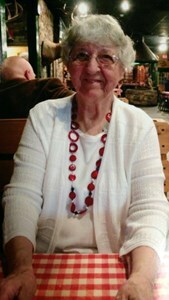 Patricia "Pat" Klika, 84, of Green Bay, passed peacefully in her sleep on February 1, 2018 surrounded by family. Pat was born on June 4, 1933, in Green Bay, daughter of the late Reginald and Lena (Baenen) McGuire. She retired after over 25 years of service with Wisconsin Bell/ AT&T. Her passion in her spare time was sewing. Pat also loved traveling, and was an avid Green Bay Packers Fan. She most enjoyed being a mother, grandmother, great grandmother and great great grandmother. She is survived by her 8 children: James (Marie), Lynn (Kevin Keely) Dunkert, Laurie Morrison, Karen, Allen (Tracy) Mary (Jim Leiterman - Friend), Thomas (Janice), and Nancy (Greg) Steenbock. Pat also leaves 18 grandchildren: Nicole (Peter), David "Dewey", Ricardo, Scott, Brandi (Nathan), Jenny (Brice), Jacob, Nathan, Samantha, Aaron, Ryan, Jared, Sam, McKayla, Nicholas, Spencer, Jamie, Jasmen; her 10 great grandchildren: Shaunda, Keely, Madelyne, Anthony, Ayden, Jordan, Allyiah, Aubrey, Addison, Harper and one great great grandchild Skylar; brother, Tom (Judy) McGuire, and her sister Mary Lou (William) Simon, along with her beloved dog, Bandit. She was preceded in death by her ex-husband Wayne Klika, 4 brothers, James, Robert, William and Michael McGuire and one sister, Kathleen Albers. Visitation will be held on Monday, February 5th from 5 - 7 PM at Newcomer - Green Bay Chapel, 340 S. Monroe Avenue, Green Bay. A funeral service will follow in the funeral home at 7 PM. Entombment will be in Allouez Catholic Mausoleum. To share of memory of Pat and leave it with her family please click on the share memories button above. Add your memories to the guest book of Patricia Klika. Aunt Pat would bring the family over to my home, and us cousins would have a blast playing. IAbout 5 years ago I went to her house to see a book about the Baenen family genealogy. I had a suitcase and a brief case of photos of the McGuire and family history . She opened the door and said, "Oh, Julie. How long you staying here for?" Later Laurie stopped in and Aunt Pat said to her, "laurie dear, can you make some coffee for us?" Laurie replied. "Yes, Mother dear. Such a lovely family. I will miss you, Aunt Pat. My sympathy to Pat's family. You are in my prayers. We will remember her in prayer this weekend at Mass.